Wolf is the latest show boy from our lovely girl Matilda. 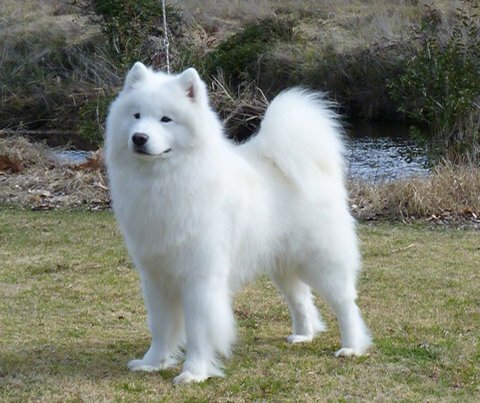 Bred in conjunction with Selene of Skyforger Samoyeds, Southern NSW. A beautiful little puppy from the beginning with a striking head Selene was simply unable to let this boy go. Wolf is turning into a stunning young man with good angles, stunning head, excellent bone, good arch of neck, good tail set and wonderful strong movement with good reach and drive. A heavily marked biscuit boy from a young age with a personality to die for Wolf has only been shown has made his mark with many judges commenting on how they simply can't look past him when he steps into the ring. Opposite Aust Bred In Show ~ "A very sound dog. Excellent head shape with well set ears and eyes and expression. Very good movement, excellent coat." Wolf gained his Champion title with only limited showing at 17 months of age.